A year into any experiment and one tends to learn a thing or two. Having opened its doors April 4 of last year, what has the informations and welcome center for West Michigan, the GoSite, learned? Among many things, that its “doors” are able to expand beyond its physical space at the northwest corner of Grand Rapids Art Museum. Since its inception, the GoSite’s mission has been to provide free, curated recommendations about what to see and do in the area. Now, it has expanded its services to include mobile welcome carts outside, across the city and at community events. 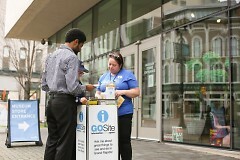 With GoSite Mobile carts at their side, GoSite Guides and volunteers have shared knowledge, brochures, maps, and collaborated research with visitors around the downtown area. 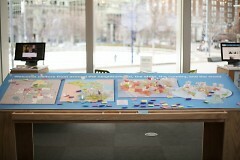 Such sharing has been in response to questions ranging anywhere from events to restaurants to housing and job resources. During ArtPrize 2015, nearly 5,500 visitors took advantage of the GoSite’s mobile element alone. As the warm weather heats up this season, GoSite Mobile will see its reach to visitors expand beyond downtown at a variety of events, including Rock the Block 2016. Organized by LINC UP, a local nonprofit focused on community revitalization in Southtown, Rock the Block 2016 takes place Saturday, June 11 around Madison Square. The annual event has evolved over the years to become a large street fair with vendors, resources, and entertainment where residents can enjoy live music, sample local food, connect with local nonprofits, and take in the neighborhood’s rich cultural history. Collaborating in the effort to acquaint visitors with the area, GoSite Guides and volunteers will be available to help residents and nonresidents with West Michigan more generally. In addition to Rock the Block, other area events embracing the GoSite’s mobile resources are on the horizon and to be announced soon. Back inside the GoSite’s physical space, kicking off a variety of upcoming programming events highlighting the area’s talent, clay artist Rita Zinn Shields will be present as a guest speaker on Thursday, March 31 from 6:30-7:30 p.m.. This date lands in conjunction with the GRAM’s present exhibition, Women Art, and Social Change: The Newcomb Pottery Enterprise, and GRAM’s free admission on Thursday evenings. Rita will be the first artist in a series of guest speakers, tapped from all mediums, to invite the community to engage in conversation in a relaxed environment and share ideas about art. Also on deck inside the GoSite space is a live music series involving local musical talent. In celebration of Record Store Day, Grand Rapidian and DJ Tom Shannon, Jr. will be kicking off such free programming with a public set on Saturday, April 16 from 2-5 p.m.. Spinning his own vinyl records from an array of genres, fellow vinyl connoisseurs are encouraged to bring in their own cherished family-friendly tunes as well. 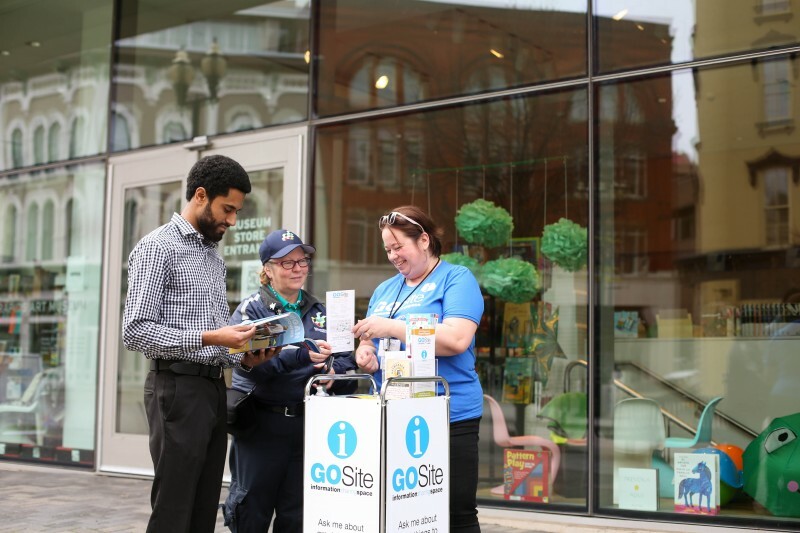 Beyond the efforts to reach visitors where they are and involve them more intimately in Grand Rapids' activities, the GoSite's expanded outreach is playing out through social media as well. Because we strongly encourage inclusion of the community's own diverse recommendations as an integral part of the GoSite's mission, residents are invited to participate in our “City Insights” series on Facebook. For the month of March, residents are asked daily what features or hidden gems of the city they'd like to share with those who might be unfamiliar with the them. 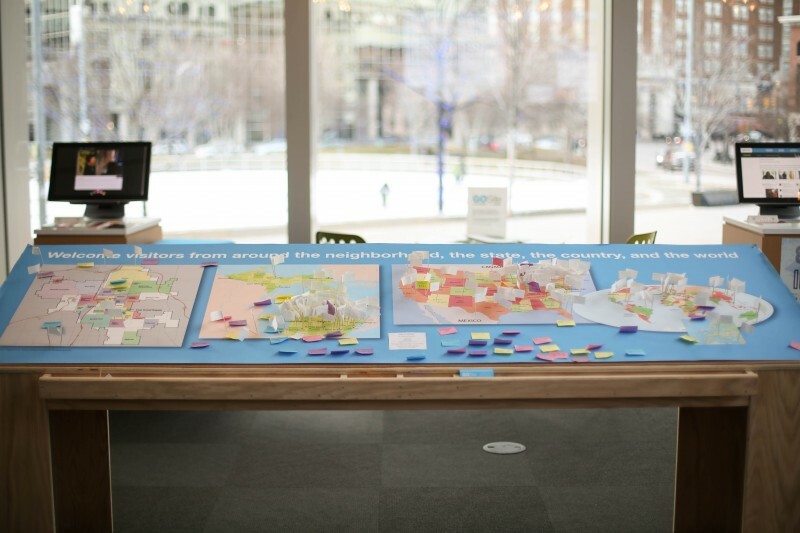 What do you love most about Grand Rapids or West Michigan? What do you want to share with those who've yet to see, hear and taste what the area has to offer? Where are the internet and larger institutions maybe missing the mark when it comes to promoting authentic local experiences? Answers to these questions are what the GoSite aims to help give a positive voice to. While the internet undoubtedly remains an effective resource for learning about an area's possibilities, the GoSites' success shines light on the value of face-to-face listening and recommendations. Gearing up for the warmer weather and expanding its doors beyond its home base at the GRAM, the GoSite and its evolving mission can be cultivated to the benefit of all who engage with the Greater Grand Rapids area.